We deal with all online transactions personally and your purchase will be sent out within 24-48 hours. It will be lovingly wrapped (except the head, of course! ), to ensure a safe delivery to their new homes. Please see our delivery charges page for details. We only accept payment by credit or debit card on this site. Cards accepted are Mastercard, Visa, Delta, Switch/Maestro, Solo. We do not process your payment until the stock item(s) are ready and released for dispatch to you the client. If you are not completely satisfied with your purchase, you can contact us within 14 days after you receive the goods to arrange to return them and receive a full refund of the purchase price. If the return is due to an error on our part or the goods were faulty, we will of course credit your payment card including the return postage along with the full purchase price of the goods. However if you are returning the goods for any other reason, you will have to pay for the return delivery via Royal Mail / Parcel Force and we will refund the original payment for the goods. Please contact us via email with your full details and product information before returning the product back to us, so we can advise you on how to return the goods safely. Full refunds are only possible if the goods are returned back to us safely, in an unused condition. All prices include 20% vat. where applicable. Registered address : Hyde House, 19 Station Road, Addlestone, Surrey. KT15 2AL Registered Eng & Wales No. 644640. If you wish to contact us for any reason, you can call us on 01929 426827, or email us at enq@corfebears.co.uk. Lines are open from 10.00am to 5.00pm on normal working days and an answering service is available at all other times. 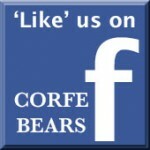 Our address is: Corfe Bears Ltd, 37 High Street, Swanage, Dorset. BH19 2LT.